We came last, caught fire, had a blast, and can’t wait to race a KA again. 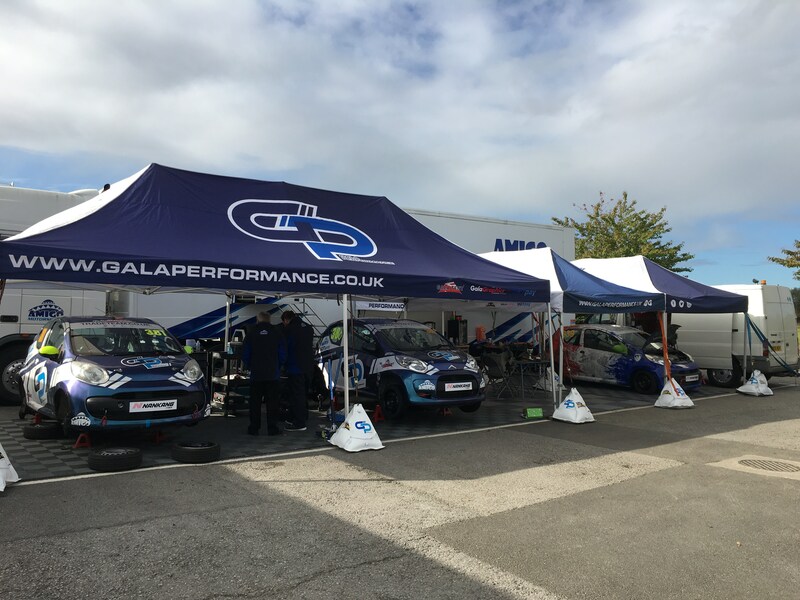 Firstly, a big thanks to Rob and Amigo Motorsport. What happened, happened, motorsport requires a philosophy degree level of stoicism. Initially, we hoped to race with 2-3 drivers and test Friday. As the race grew nearer people dropped out and the KA’s cage didn’t show up until Tuesday before race day! With no other takers and a last-minute build, this was a gamble. Rob was upfront and explain qualifying would be our shakedown. We’d split the driving and he’d keep costs down as best he could. The prospect of not driving or getting any signatures for the outlay wasn’t an easy call to make. However, nothing ventured, nothing gained. 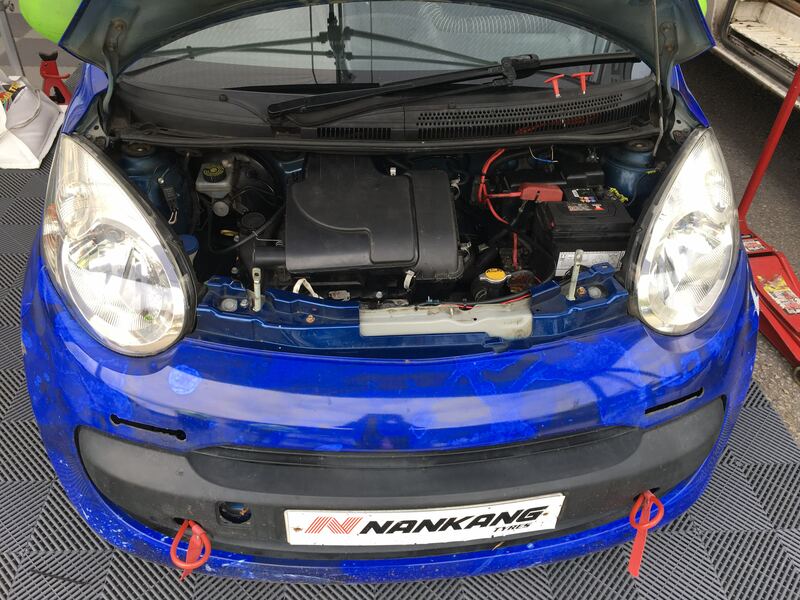 This was an opportunity to race in a new series and help Amigo develop their KA. At each stage of the build, Rob offered an out and registered us at the last possible moment. I made my peace with not getting signatures or race experience for the money invoiced. 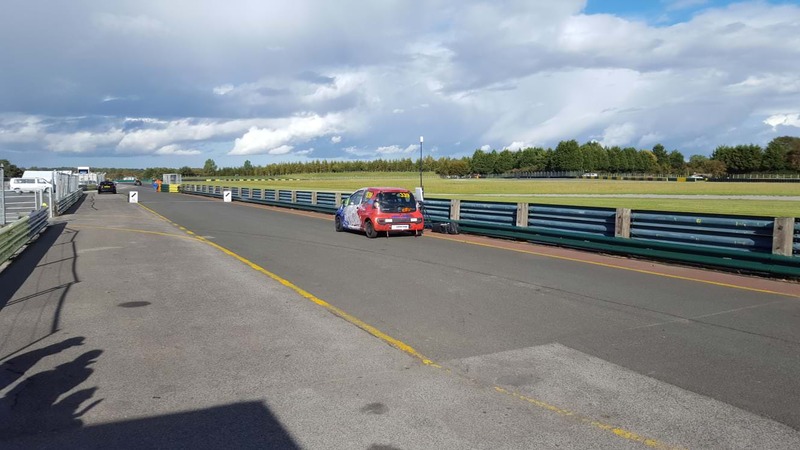 Donington hosted the first race of the new MSV EnduroKA series: https://www.enduroka.co.uk/ – A big selling point. Unlike Croft (my first race), I have driven Dony lots and LOVE IT. It’s a close second to Thruxton as my favourite UK circuit. 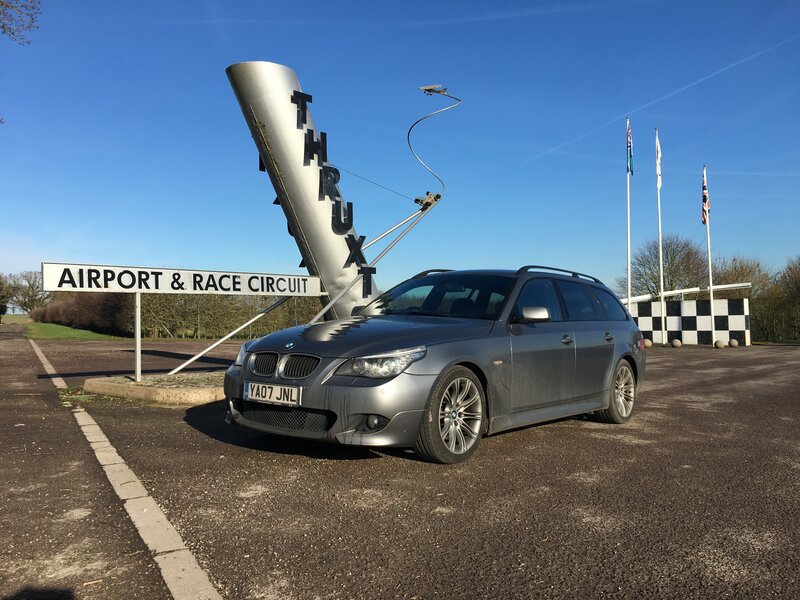 I’d borrowed Pistonheads race notes, thanks to Instagram, and watched some more youtube videos in preparation for tackling the legendary Craner Curves. Rob planned to take the KA out for a shakedown, bring it in and let me have 30 minutes to get acquainted. Then he’d finish the session and set our qualifying position. 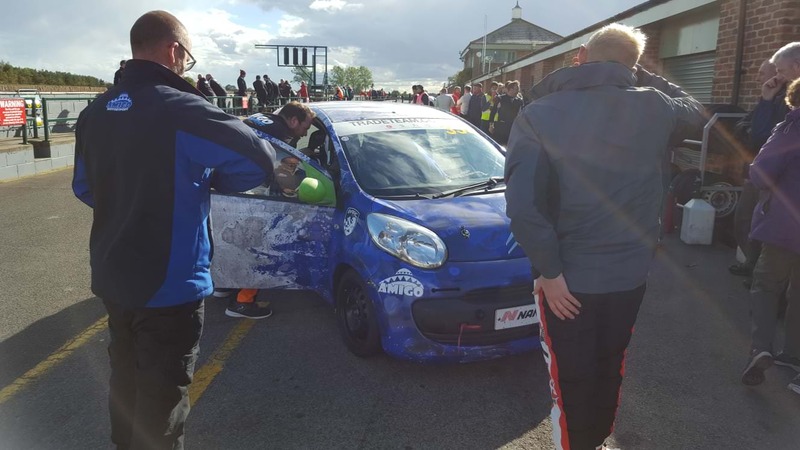 Despite a new rad and thermostat, this plan was dispatched five minutes into qualifying when Rob came back in with the KA overheating. Just an airlock? The KA was bled and I was sent out. Carefully, and to bring the car back in at any signs of overheating. My first laps were a lot of fun. Craners is flat, no question. Only third and fourth are required. The KA felt confident on the brakes, turn in vague but once hooked up the grip was dependable and the KA was surprisingly adjustable on the throttle for the lack of power and torque. After a few laps, it started to feel like all was not right at sea. I could smell heat, a whiff of hot coolant and then the temp light started to flash on Starsky’s straight. Returning the pits wasn’t the happiest experience. This was no airlock, this was the head gasket. This was my two signatures and race disappearing. Or was it? The Burton Power team kindly offered a bottle of K-seal and I was off again. New plan, similar to the old plan: a few more laps, watch the temps and for the board, and then Rob would go out and qualify us! This time out I was a little braver and quicker. The team took the decision to simply accept my qualifying time and leave me out until the checkered flag. 1.42.373 qualified us 22nd of 26. I was a little down on hearing this. Visiting other garages, it appeared they’d all used their fastest and experienced driver, as we would have, and lots of the other drivers’ pace was a few seconds off mine. This lifted my mood, slightly. Fingers crossed for the race! Rob offered the start but with his skills and experience it would have been crazy to not let him make some places up. Especially with the high potential of places to be gained as a result of my qualifying time. As the KAs rolled over the start-finish line, Rob was off! 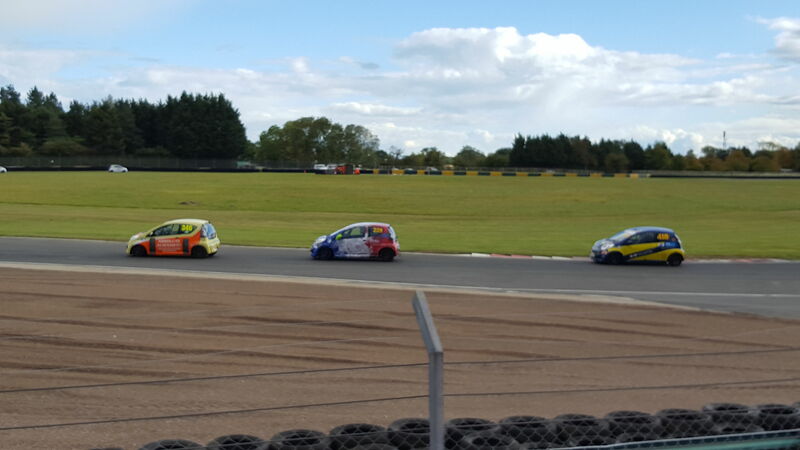 4-6 cars dispatched as he managed to get an inside line into the first corner. From the pit garage, we saw a puff of smoke and 2 places were lost as Rob locked up the front. As Rob came round for a second lap he’d made up more places but the right indicator was on. He was going to pit next lap, something was wrong. No rear brakes! Rob and the team leapt into action. The issue was quickly diagnosed as a corroded rear brake line on the driver’s side. Rob told me to get ready, I was going out. A replacement was sourced and fitted (thanks team 19) and I was back at my favourite Mutu tag system and into my first KA race. Being firmly last, many laps down, with questionable reliability, and now out with the faster-starting drivers, a sensible person would have realised that cruising for over an hour would be an easy 2 signatures. Yeah, sensible, get those sigs. Ooooooh look, I’m gaining quite a bit on those two KAs in the distance! Reeling them in over three laps, Foggarty Esses sees them brake on the crest and before I can overthink it I’m flat down the inside. My nose is just ahead and I’ve squeezed them to give myself as much space as possible. Big stomp on the brake and gingerly peel it off to trail the KA in. Jeeez that feeling! Can’t dwell on it for too long, another KA brakes early for corner one, Redgate. Carrying more speed enables me to make a move on the outside of Craners. THE CRANER CURVES. Forget the double overtake, this is my lasting memory of Dony. OK, KAs are not fast, but two abreast through Craners feels like threading the needle. The extra speed gives me room to move back across for Old Hairpin and more targets up ahead to unlap. Much like the C1s, some are faster, some are slower. I try and observe the pit boards to see whom the top cars are and give anyone faster enough space so as not to compromise their race. Unlike the C1s I feel more confident and assertive. Most of my overtakes come from inside dives, braking later into Foggarty Esses and Redgate. A few from carrying more speed through Macleans and Coppice. None compare to the feeling of going around the outside of Craners. Coming round the start/finish and scanning the pit wall I see my T60 board. About now I am a bit of a sweaty mess, the KA is hot and physical. More physical than the C1. Despite the comfy seat, I’m feeling all 60 of those minutes. The wave of euphoria of driving &surviving for over an hour reduces that feeling, all thoughts of fatigue are replaced by the desire to keep pushing. Regardless of our position or finishing the race, I’ll have earnt two more signatures on my race licence! And, that’s all folks. If you’ve managed to read this far! Once again, massive thanks to Rob and the Amigo team (and special thanks to Joel for quick thinking with the fire extinguisher). Also, thanks to MSV and the other competitors. The atmosphere, driving standards and general ethos of EnduroKA was great to witness and be part of. Quite an experience, my first fire, 2 signatures closer to my Nat A (2 to go), and already looking forward to racing KAs again. I’ll happily race either, both are great fun. 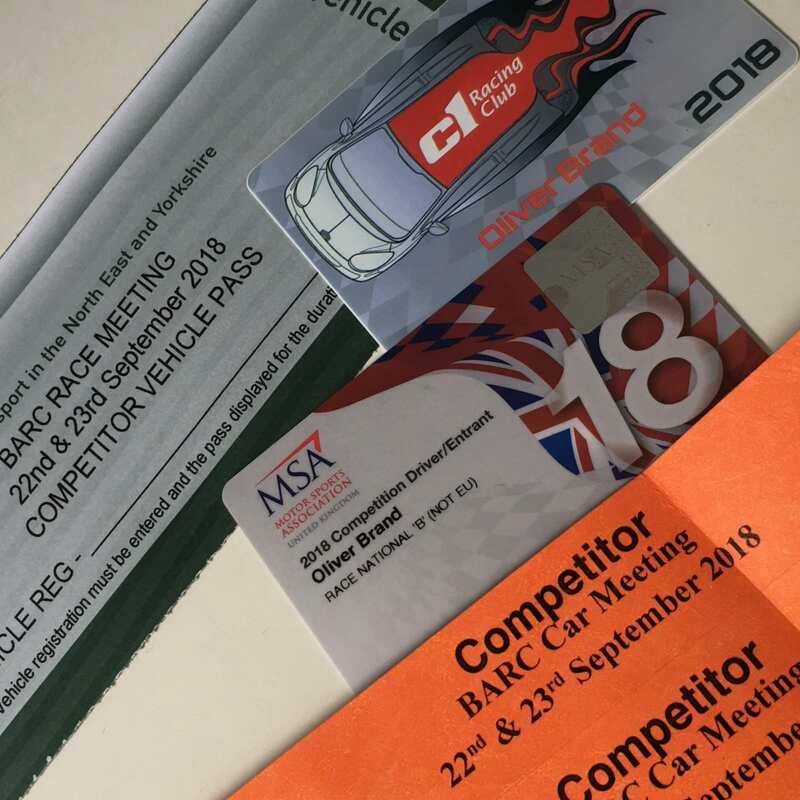 I’m not a motoring journalist and have only driven a single racing KA and C1. Others may differ. 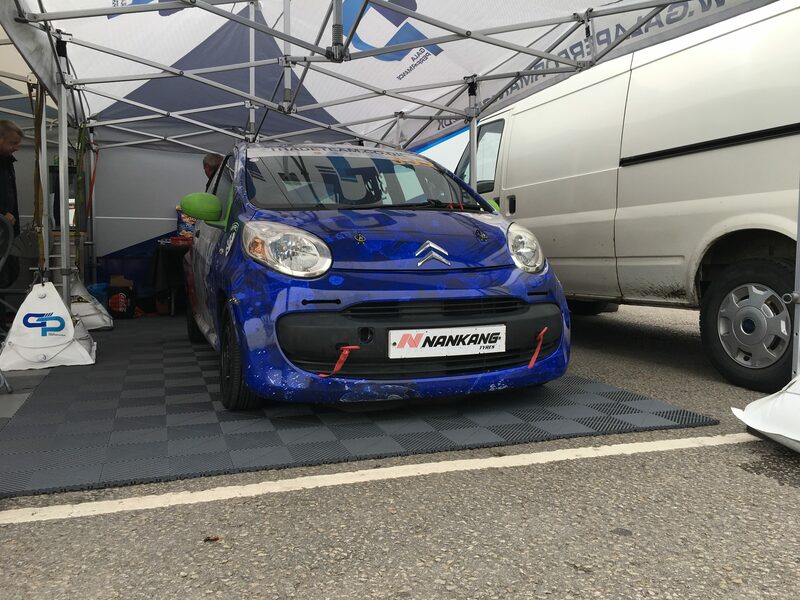 The C1 was driven on a track I didn’t know, the KA on track I know and love. The C1 was less stable and more twitchy, light and lithe. It pivoted around its engine and front axle. Turn in was nervous but good, the rear quick to move. Brakes fair, easier to trigger ABS. If you got on the gas too much too soon it would understeer. The KA rotated slightly slower, turn in muted but more grip once you committed. Less edgy, easier to control, more physical, heavier. It appeared to rotate more around the middle of the car and the rotation could be controlled more with the throttle. A lot less steering inputs required to correct oversteer. Stronger brakes with more feel, easier to judge and I was more confident on them. It was also easier to trail brake, and pretty essential to getting it rotating on entry to the slower corners. In the C1 I didn’t have the capacity to heal and toe, and didn’t even attempt it. There was too much else going on and not enough mental bandwidth. In the KA I was better placed mentally and achieved it for most of my downshifts. With a gun to my head, I’d marginally pick the KA. Max is having a good time, it’s his local circuit and the marshals and ‘crowd’ love him! There is no pressure, and if I were him I’d assume the team rookie has just had a bad experience warming up. It’s now time to make up some places. AND THEY ARE OFF! Except we’re not. Max gets passed by 3-4 cars coming out of Chicane. He comes into the pits and the team change the coil packs and send him out again. He’s back, it’s even worse. The team are working flat out and I keep well back. Kurt is doing a great job of listening to my verbal diarrhoea. Somehow, someone thinks to check the earth strap and it’s loose! Tightened and Max is off. We’re now dead last, 34th, 5 laps down, which equates to 6-7 once the out-lap is complete, and Max goes on a charge. I’d love to tell you more about this, but it’s this moment that all of it begins to dawn on me. I blink and Mark is in the car and off. Max’s parents are very sweet. Kurt and I talk with them on the pit wall, and by talk I mean I talk lots. Max’s parents find my situation hilarious and are nicely supportive, explaining where they expect to see me follow their son and Mark’s examples of brave overtakes. I experiment with trying to get my HANS on with helmet attached. 99.99999% sure Kurt wants to laugh out loud watching me, an uncoordinated bag of nerves trying to fumble it all together. Kurt does a sterling job of holding the laughter in. It doesn’t work and I retreat to the garage to get suited properly. Then I’m stood by the car and it’s being refuelled. Up to this point, it’s been mostly dry and sunny. Max tells me to enjoy it and if it rains watch out for Corner 2 and Tower. The rest of the track will be slippery, just mind how I go and get at it. That’s it, the team strap me in #339 and away I go, via the tag system. This time using first instead of my previous third-stalling-starter-motor strategy. Lots of drivers were quicker than me and a few weren’t. The opportunity for my first overtake presented itself in the form of a red c1 that was marginally quicker in a straight line but slower through the corners. Over two laps I start to reel him in. As we exit Corner 2, I’m in second and going for it up the inside. My nose is in line with his door, and he comes across to defend. Leaving me the choice of crash or back out of it. I wasn’t close enough to try it and I didn’t commit enough. I stay glued to his bumper through the Chicane and on to Tower. Through Tower he holds me up and I get a run on him into the Esses. Not enough of a run to draw level. Same again, he comes across and I have to back out, take to the grass, or we collide. I get straight back on his bumper and am rewarded at Sunnys when he out brakes himself and the opportunity presents itself to take him on the inside. Thanks to Max’s coaching I’m in early and then keep him on the outside of me as I maintain as much momentum as possible and exit Sunnys. Woooooooo HOOOOOOOOOOOOOOOOOOOOOO, my first real overtake. A few more occurred with people out-braking themselves, getting a wobble on, or making a mistake. Especially in Turn 2, Tower, and Sunnys. In a one-make series I guess, unless you have a serious talent/speed difference, that’s how most overtakes go. Thanks to Max’s coaching I do OK and hold my own. 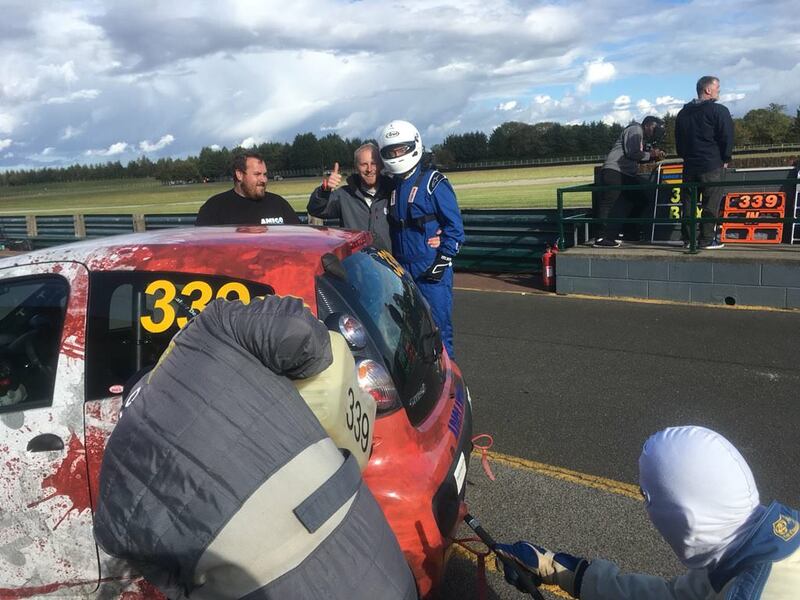 Thanks also to Dale’s coaching/idea (and doing lots of track days in MX5s), a few times I jumped on the back of a faster car pushing its way through and got through as well. It had been spitting a bit, on and off light rain. 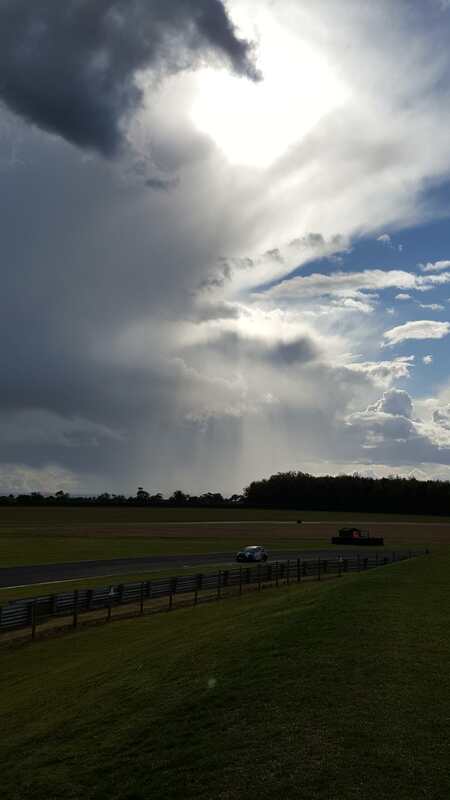 The safety car came out for the second time in my stint and I could see the weather looked ominous. The light rain made things greasy but it didn’t slow anything down. I was convinced the team would bring me in as I’d been out nearly an hour by this point. 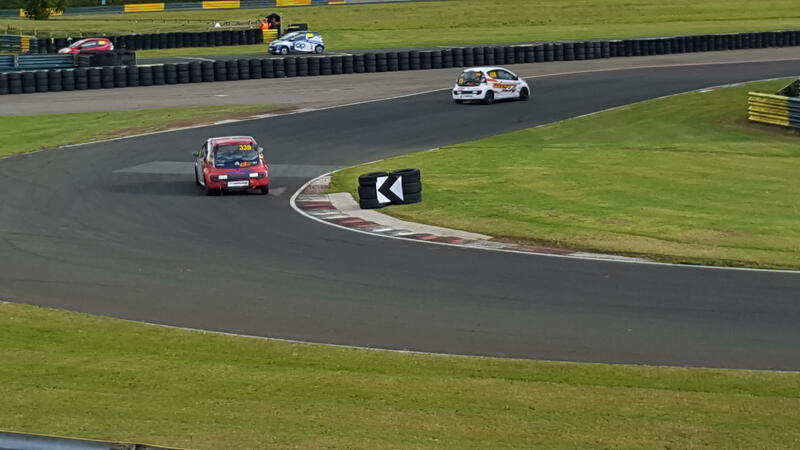 The safety car came in, racing resumed and a few laps later as I came down the start-finish straight all hell let loose. I thought it was just heavy rain, apparently, it was hail. None of this really registered beyond it got slippery fast. Remembering Max’s advice I was hesitant into Corner 2 and so glad I was. There was 0 grip and the car moved 2-3 cars width across, with a ’neat’ four-wheel slide. I could see cars spinning and going off in front of me. One car even missed Chicane. Coming out of Chicane I actually passed a couple of cars and with a flurry of smooth hand movements (if that’s not an oxymoron) I held on through Tower and up the Esses as more cars explored track limits and 360s. I found the light switch and wipers and settled in. As the rain eased things got easier and grippier again. Another safety car, a few more laps, and the board came out. That was it, I’d done it! An incident and spin free stint in my first ever race. * Croft is really far from Cornwall. * C1 racing is something I NEED to do more of. * Max Coates = awesome. Awake at 6ish (better than 5am) and started looking at Max’s lap vs. my laps again. We’re due at the circuit for 10:30ish and I head up for 10am to soak it all in. Thanks to Qualifying and Max’s coaching I feel more excited than nervous at this point. Mark and Max arrive, Rob comes over to talk tactics. What’s our strategy? It’s agreed: Max to start, Mark until we need to refuel, me after refuelling, and Max to bring us home. There is a more to the tactics I don’t think it’s fair to share. I volunteer that I’d like an hour for 2 signatures, even that I don’t mind not doing if they want to give Mark and/or Max more time. The briefing is hilarious. I’d of previously given BaT’s Jonny and Darren joint first for best briefings. That honour now goes to the C1 organisers. MSE by FAR THE WORST, EVER. Lots of in-fights and digs arrive from the questions. One of the organisers makes a fantastic point. This is a five-hour race, if someone is slower than you, you will find a way to overtake. If you gamble or overly defend a position and take both of you out, no one wins! Mark echoes this advice and likens it to a thinking man’s game more than a 20 minute “who is the fastest?” sprint. It’s agreed the best use of the warmup is to get me out on the circuit for all of it. So that’s what we do. I head out and make a move on a car at corner 2 (technically 1, you join the circuit at 1 from the assembly area). 2nd gear really does give more drive out of it. Thanks, Max! We’re in a jostling train up to Tower and a few cars pass me on the inside. Going into Tower I use the last passing car as a means to get around two more cars. Then we’re back into a train for the Esses and my elbows are out. I need a clear run into Sunny to practise Max’s coaching. It feels much better and means I exit Sunny out faster. Then I get mobbed. Ah, perhaps I’m not Senna re-incarnated. As we join the start-finish straight I get a poor exit out of Hairpin. I momentarily triggered ABS and it understeers a car length deeper into the corner than I’d like. Which leaves me with what feels like forever turning and waiting to get back on the “power”. Unsurprisingly, I get mobbed on the start-finish straight. This gives me some space and I settled into a rhythm and focus on corner 1 and Max’s coaching. This C1 is far greater than the sum of its parts, it’s pointless trying to justify it, until you drive it you would never believe me. There is a problem. I know I am faster in all three areas Max has suggested but my lap times are up and the car seems to be down on power above 4k RPM. Unfamiliar with the car and aware it’s carrying a full tank of fuel, I don’t know if it’s me, or me driving badly and looking for excuses. It seems to be getting worse and I head for the pits. 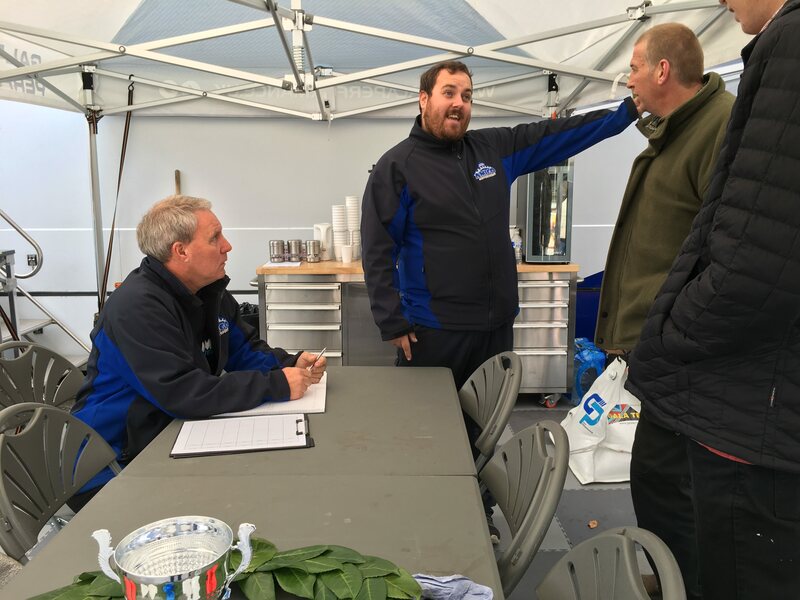 The team are ace, I explain what’s happening and they take a look. They can’t see anything and send me out again, saying they’ll change the plugs as car 385 had similar and that fixed it. I get an out lap and one more lap before the checkered flag brings the warm up to an end. The team check the car over and change the plugs. Even on the old plugs, it appears nothing is wrong, no fault codes, and we can’t seem to replicate it. Keith suggests we’ll only find it under track/race conditions. Apparently, it’s not a good idea to try and simulate that in the paddock (my one token suggestion). I meet Mark (Rich’s partner in crime) at the Amigo Motorsport setup, I can remember floating rather than walking to meet him. He can clearly see I’m a bundle of energy and nerves. Rich neglected to mention to him I’m a complete novice. Thankfully, I told him on the phone the night before. His expectations are low and he gives me a great chat to help settle my nerves. I meet the team, sign-on and it all starts to get VERY real. Max rocks up, loves the fact I pinged him on twitter and our DM chat consists of him saying hi and me blurting out I’ve never driven Croft, never driven a C1 (or sat in one, more on that to come) and never raced. He finds it all funny and isn’t phased. He pulls me aside and gives me some pointers and gears for corners. He’s a great coach, I sense a Teffers-esque level of man-crush developing (minus the hair). I’m hoping to become faster just by standing near him. The team agree Max goes out first to put us on pole (hang on, this is my first race, pole???). Mark goes out second and will just do his minimum 3 laps to qualify. The rest of Quali can be my time to learn which way Croft goes and get familiar with the C1. Max goes out and is a little way off pole (few ). He and the team boss, Rob, agree the new engine is tight and we’re down a little on power vs. some of the field. This is a great excuse, I make a mental note of it and save it for later. Mark goes out and isn’t far off Max’s time. The team agree Max should go out again after as many laps as they can squeeze me in for. Showtime! Our mechanic, Keith, tells me to be smooth and have fun. He asks the standard questions: Driven Croft? No… Driven a C1? No… Well, at least it’s not your first race… Err, about that… He looks at me with a wry smile and with that, I am belted into the C1. My first stress is the Mutu tag, this needs to be held up to the receiver on leaving the pits to log my laps as the driver. I’ve watched a few cars have to reverse and shuffle embarrassingly. If I wasn’t nervous enough, this feels like an extra mental challenge I do not need. Thankfully, I select third, and proceed to use a combination of stalling and the starter motor to get myself to the receiver… Quite what Mark, Max, Keith, Rob and the rest of the team are thinking I have no idea. I have a slightly bigger issue… At this point I realised, I’ve never been in a C1. I have no idea where any of the controls are, and I’m about to join a live circuit for my first ever qualifying and laps of Croft. It’s OK, by the exit of corner two I’ve worked out where the Rev counter is. Enter Mental note: Next time sit in the car rather than just take pics of it!!!!!!!!!! After qualifying the team are in good spirits. Amigo Motorsport has 3 of 3 cars in the top 10! 381 at 3rd, 385 in 5th, and us in 9th. I’d wondered if not putting the car on pole would impact Max at all. It didn’t, he was still lamenting how much fun it was and had a smile on his face. We’d put cameras in the car so we could compare Max, Mark, and my laps. Max then spent a generous two hours going over his laps, my laps, and Mark’s laps. The other Amigo Motorsport teams showed some interest and we had good chats, banter, and discussion. This was club level motorsport. I was part of it. This was my tribe, we were doing this. It’s a little cheesy reading it back but it’s no less true. This was what I wanted, it’s not just being sat in the car doing laps, it’s the whole experience. Turn in earlier at corner 1. Throw it in and just let the car slide out. Then a dab of the brake and use 2nd for Corner 2. Turn in earlier for Tower and use 2nd, be more aggressive, throw it in. Turn in earlier for Sunny In, be more aggressive, throw it in. Then let it run out to the curve before apexing Sunny out. All three bits of advice proved invaluable, in the race those three are where I made most of my passes. The dream of racing has haunted me for a long time. Starting around twelve, specifically: Donington, Murray Walker & James Hunt commentating, the rain, and then some utter Senna magic. This has led to many track days and ‘Ring trips. I’ve been lucky to do this as a hobby, and for the friends and experience so far! However, it’s not racing. Involving various friends I’ve tried to push racing further. Finally, announcing doing the Caterham Academy and coming close. However, it wasn’t to be. Too many good and bad things happened. Racing couldn’t be a priority, my place was cancelled, and it hurt. An odd hurt, because nothing is actually wrong, yet something was. The exact ‘thing’ is hard to explain, the Bruce Springsteen line “Is a dream a lie if it don’t come true, or is it something worse” encapsulates it perfectly. Enough of the prattling, on to the next chapter of the story (and more prattling)… Picture the scene, it’s a dark wintry night on Wednesday 26th October 2016. Seven friends meet on t’mores at the Cricketers for a meal. Not sure it is the mores, let’s go with just outside the Peak District but I wanted to use “t’mores”. During the meal, a friend commiserates about the Caterham dream and says “Why don’t you just get your race licence?”. And, I’m like: “Yeah, why don’t I just get my race licence”. So I did, I ordered an MSA starter kit and booked my medical and ARDs. Pub plans, completed it mate! It’s now Christmas 2016, I am pumped, I’m going racing!!!! I even got some fireproof socks from the family’s Secret Santa! Game on! 28th December, my wife wakes me up and says “I’m late”. It’s 5am, I’m like WTF is she talking about. Surely 5am means we should be asleep. Who gets up at 5am?? Honestly!!! Turns out mini-me is on the way!!!!! Wife and I agree: I’ve paid for it, stressed over it, and done the medical. Do the ARDs and we’ll see from there. Two weeks later, my alarm is set for 5am and I am off to Thruxton. After a long video interlude, I sat the written test, passed it, and was into a Cayman S for 10ish laps of keeping it on the black stuff. We didn’t exactly get off to a great start. On leaving the pits I assumed it was race conditions and proceeded to “do” two of my “competitors” into Campbell. Only to be told by my examiner that this isn’t exactly race conditions, keep it on the black stuff, stay within reasonable lap times, and prove you’re not an idiot who dives people on the first corner. Right, got it… At least it settled my nerves and meant I had a clear track for the remaining laps. By the end, the instructor was pretty chatty and I got the feeling things had gone OK. The next 12 months are a blur. Watching a child being born is mental and then you have to look after it 24-7! The idea of racing C1s greatly appealed. Most of the cars I’ve driven have been momentum based e.g. they have/had no power. 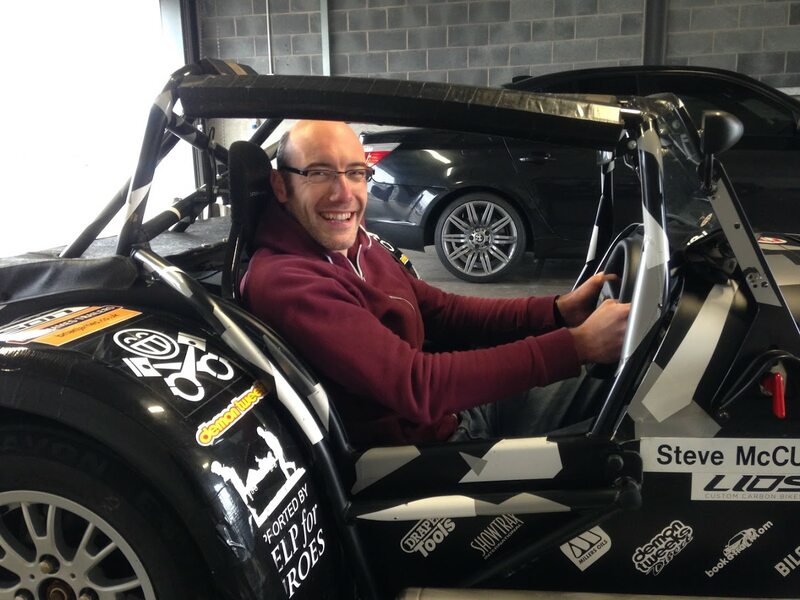 All my Swift laps and MX5s have to count for something. I like endurance sports: Marathons and long distance open water swims. I don’t ever think I’ll be the fastest but I hope I can be consistent and dependable. A friend tells me I’m too light to be part of his team (he wasn’t that polite). Another friend proves more amenable and a plan starts to form. If the opportunity arises I’m joining team Bernard. In my mind, I am thinking it will be a friendly bunch, aim for a circuit I’ve driven, low pressure, do what I can, and have some fun. I’ll be a fourth driver and some finances to help the team race more than my performance on the track. Game on! 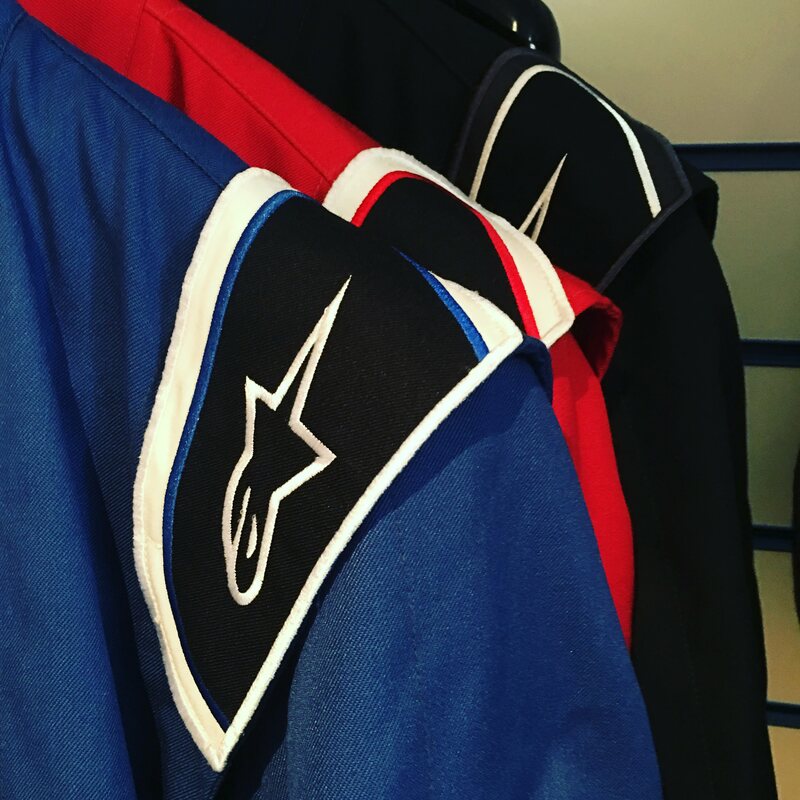 Bought a black suit from Merlin motorsport (having tried lots on), black so it won’t show up the dirt as badly. What amateur, who has to pay for their own suit, wants a colour other than black! Well, that was the plan… Love it when a plan comes together! 2) Other than Knockhill it’s the furthest mainland circuit, a mere 460+ miles away (living in Cornwall has some downsides…). Oh well, the date fits, you only live once, wife gives her blessing. Rich PMs me to confirm our entry and some details, I join the C1 club, the excitement starts to boil over. I want to tell everyone but the Caterham experience and pain of having to tell people it’s off is still too real. So I stay shtum. Rich pings to say there is a chance Max Coates might be driving with us. No idea who that is, so that’s fine. Hang on, Max Coates, who is that? Google… Oh, oh, right, and the team we’re racing with are also one of the bigger names in C1s now? Oh, right… And, the fourth driver has broken his wrist so he’s out and it’s now the three of us. For 2-3 hours investment, there is a lot to be gained from the badge. Even for experienced Agile practitioners. The common language and practical application of agile practices would benefit all. Asking why three or more times evolves the answer with each iteration. The test example worked brilliantly. After five WHYs the final answer answered the original WHY the best of all. It served as a good reminder for both the power of iteration and asking WHY more than once. Who, What, Wow! Consistently breaking down complex problems and user requirements into hills is a great practice. If the whole team adopts this approach it’s an excellent way to translate, discuss, and record complexities. Market Playback, Outside-in market point of view, what else is there? Endeavouring to make things perfect is all too easy, including the wrong things. The idea of LowFi and HighFi, choosing when to put the time in, and being honest with deliverables that can be less invested in sounds obvious. However, until seeing this approach it wasn’t to me. The terminology allows you to make an informed choice and communicate that within your team, stakeholders and users. LowFi isn’t an excuse, it’s an efficient use of time to establish what’s important and free more time for that. What needs to be HiFi? Would it be better to go LowFi and spend effort elsewhere? Making decisions as a group enables moving forward. Yet another reason all members of a team/everyone should undertake the design thinking practitioner badge. Looking forward to putting the badge’s training into action. What are your takeaways? Last week I volunteered as a mentor for the Code Club Cornwall: Mission to Mars Easter School. It’s a great project for teenagers interested in programming, electronics, and computer science. Bert and Ernie, two Arduino-powered robots, offer the participants a chance to program self-driving ‘Mars Rovers’. Destined to auto-pilot around the surface of Mars. Functionality is developed using Agile methods and a series of stories. Starting from scratch, developing Bert and Ernie’s auto-pilot capabilities over 4 days. Participants work in teams: mob-programming C++, creating breadboard circuits to replicate Bert and Ernie, using GIT*, managing a budget (paid per story), and developing on Rasberry Pis. It was great to see participants working together, learning and having fun. All in a very professional manner. A lot of progress was made, at a rewarding pace, over the 4 days. It’s a great way to learn to code and improve programming skills. A challenge for any level of programmer, beginner to advanced. Mob programming helps the team develop a solution and learn from each other. Bert and Ernie add tangibility, allowing participants to see their work in action. Not just programming, the course offers softer skills development/practice and simulates a professional working environment. Just do it! I’ve not programmed for 7 years, and not touched C++ for the best part of 13. As the lead mentor will attest, I was nervous. This soon faded as the tasks became more and more engrossing, and challenging. With a good level of competition between the teams. I’d forgotten how much fun programming can be. A new way to conduct retrospectives! Brainstorming using the grid / 6 boxes shown below. I’ll pinch this for the team and our end of sprint retrospectives. Focus less on the solution, and more on coaching the participants. It was hard not to get sucked into making the rover ‘perfect’. I forgot how much I missed programming and in some places over complicated things e.g. the rover needed to move forward 2m and I was driving the kids to make it programmable as a procedure that accepts a direction (forward/reverse) and a distance in MM. The objective isn’t a perfect rover, and a perfect rover shouldn’t be at the expense of the participants’ learning. Risk an OO approach, and set it up from the start. Our C++ was very procedural. I will do my best to coach the participants in OO programming concepts next time. Creating motor, robot and other sensors / real world object classes, and some design up front to assist with this. I’ll brush up on my C++. Just the syntax, structure, and basic keywords would have helped. Thankfully the course lead was very patient. Massive thanks to Bluefruit for the use of their office, and for Byran (course leader), Ben, Harvey and Tyler’s time. Harvey and Tyler are apprentices at Bluefruit who’d attended the easter school the year before! Thanks to Glen and Lyssa from headforwards. Please get in touch via Software Cornwall if you’d like to attend, like your kids to attend, or if you’d like to mentor (if I can do it, you can!). Can’t praise either experience enough. DO IT! Thanks also to IBM, my manager, Jon and his manager, Anita, for their support in being a mentor. For more information see the Software Cornwall website. Bert and Ernie are regulars at the Saturday Tech Jams. If you can’t make one of the Easter/Summer schools look out for them there and at the Royal Cornwall Show. With the roof on and better than expected weather in the colder months work carried on outside. Our original plan entailed cladding the first floor in wood. As part of our ‘Cornish-New-England’ theme. Allowing it to age naturally. In theory, this is low maintenance. In reality, I had visions of having to regularly pressure wash and treat it. The architects were flexible in their specification of how we’d clad the house on our planning application. However, a planning approval condition required us to submit example materials to be used before building could commence. At this point, our builder spotted a potential issue. Building regulations require wood cladding to be treated with a fireproof coating if another property is within three metres. The theory being that if the other property sets alight the fire could easily spread. Not a huge issue in itself, lots of fire-proofing techniques and options exist. Sadly, none of them would achieve the look we were after. Enter the new contender. Despite it being cliche and overly popular on new-builds, I really wanted Cedral Lap Weatherboarding: Zero hassle, great range of colours, never needs to be painted, resistant to rot and things growing on it, and only needs rain to clean it. What’s not to like! Massive thanks to Carly and Charlie at Ocean BMW for the loan of their i3. It’s fair to say our recently acquired 10-year-old Audi A3 hasn’t filled the big hole left by our departing BMW 1 Series. I loved that car way too much. IBM’s not so great company car scheme, UK company car tax, and building a house put an end to ordering a replacement. However, enter the BMW i3 as a possible new contender. With a £5000 contribution from the Government’s green motoring initiative, and only 5% benefit in kind (BiK), it’s a good value way to drive a BMW company car. Preconceived concerns can be summarised as range anxiety and charging hassle. Our car usage is fairly typical for Cornwall/more rural dwellers. My better half commutes 40 miles a day, and I mostly work from home. At the weekends, we tend to average around 60 miles. We only need the i3 for commuting and short trips. We’d keep our 5 Series for longer journeys (and towing duties). BMW offer the i3 with a range extending petrol generator (REX). The REX increases the i3’s range to over 100 miles, and would be essential. If we missed a charge the purely electric i3 wouldn’t work. We’re too far from a fast charge network to risk no backup. My occasional work trips also wouldn’t work, Hursley and London are both too far to consider. Even with rapid charging points at Cornwall Services and Exeter. Therefore, for the i3 to work it has to be the ultimate commuter and ideal for our shorter journeys. Charging is easy, and plugging in saves a fortune at the pump. Even after IBM’s poor car scheme, the i3 would net cost us around £100 a month. Factoring in savings on fuel and assuming we charge it at home every night. By contrast the 10-year-old Audi A3 will likely cost us more than that in depreciation, tyres, servicing, insurance and road tax <<man maths alert>>. The charging system is well thought through. Far from being a chore charging was simpler and less hassle than we anticipated. With the reassurance of the REX, our preconceived concerns were significantly reduced. For any journeys over 100 miles, we’d use the 5 series. Unless we could use the fast charge network and treat range anxiety as part of the adventure of owning an i3. Very easy to drive, curiously requiring a different but satisfying driving technique. BMW implemented a one pedal driving system for the i3. Lifting off the accelerator causes the motors to regenerate which brakes the car. A big lift will even see the brake lights come on. After a few minutes of adjusting, the pedal is quite sensitive, this proved very enjoyable. A rewarding skill to balance the car, keep cornering smooth and try to avoid touching the brakes. Pre-planning and a further focus on road-craft reserves the brake for parking and emergency situations only. If everyone had this pedal driving standards would significantly improve, mine included. Lots of nice touches and detail. From the carbon fibre sils to the latest iDrive, the i3 is very cleverly packed. The suicide doors and rear leg room make it easy to transport four adults. Access to the rear seats is surprisingly good, helped by the front seats sliding forward. The dash and interior are the usual high-quality BMW items, familiar across the whole BMW fleet. With the odd random material used for its green credentials rather than aesthetics. These odd materials served as reminders it’s an eco car rather than detractors from the overall quality of the cabin. YF64 GPO even came with some bamboo dash inserts I’d not bother spec-ing, but each to their own. Torque, constant torque. Up to 30 mph not much will keep up with an i3. Certainly not much you can buy new for similar money. It’s electric *BOOM* *BOOM*. As a life long petrolhead who’s been lucky enough to drive a lot of different cars it’s certainly unique. Flat to the floor it just keeps going, and going, and going. A constant and consistent shove from the back of the seat until around 45mph. For city driving it would take some beating. Fear one if you challenge it to a traffic light Grand Prix. 1. The boot is too small. We’ve a dog, and that either means we’re down to 3 seats or no boot. Even down to three seats the boot is still small. Too small for our current and future needs. 2. Over 45 mph, especially on exposed roads with poor surfaces, we found it very loud. Road and wind noise seemed to affect YF64 GPO badly. My better half enjoyed her commute and time with the i3 but complained it was too loud for her to want one. The next day I did 90% of her commute and begrudgingly knew what she meant. Over 45 mph it seems very loud, even compared to our tractor Audi A3. 3. While it’s true our loan period covered a blustery few days, it left an impression of i3s being easily affected by the wind. Where the A30 is exposed in places I found myself constantly having to correct the car and adjust it. At the end of a long day, my better half doesn’t want to be wrestling a car up the A30. I get the feeling YF64 GPO’s optional 20s do it no favours in the handling stakes, I’d like to try one with the standard wheels. The 20s might contribute to the road noise issue we faced, especially when combined with poor road surfaces. Despite the 20s it turns in very well and offered a lot more grip than the narrow tyres suggested. My friend Ross, an i3 owner and advocate, encouraged me to find some good B-roads. He’s not wrong. On a B-road, it’s surprisingly fast and fun! Especially once you’ve spent some time getting used to the one pedal driving technique. I saw the range rightly plummet as my smile widened and hedges became a blur. This is not a car for shy people. The car gets a lot of attention. People stop and stare. I’d almost listed this a good point because some people even let us out, or gave way, just for an extended opportunity to look at it. Drive an i3 and you get noticed. For better, or worse. A good exercise in evaluating our driving needs, and a great experiment. Glad we’ve done it. Very thankful for our few days with the future. At this stage, it’s sadly a ‘no’ from us. As a city car, I don’t see how it’s rivalled. But for our needs, it’s too small, too loud at higher speeds on open roads and too light to not be affected by the wind. Thanks again to Ocean BMW, and thanks to Ross and the UK i3 Facebook Group. It’s a truly brilliant car, and I mean it when I say the future. If you can align it with your needs you won’t be disappointed. Book a test drive today and find out for yourself. Roofing came with a choice to make: To loft space, or not to loft space. More of a debate than it sounds given our open plan living space… Do we sacrifice storage for increased ceiling height? Yes, yes we do. The loft space would have been tiny, costly and hard to access vs. much higher ceilings in all of the upstairs rooms. Lots of visitors have commented upstairs looks small from the outside but is actually a TARDIS. This is largely thanks to CAD’s clever design of our windows. It’s deceptive what’s upstairs and down. Keeping the proportions of the house in keeping with surrounding properties, while giving us enough space for our dream family home. I’ll just lift the timbers up….. What power cables? Rich opted for Travis Perkins to manufacture and supply the roof timbers flat packed, with his team fitting them. For felt & battening, supplying and fitting tiles he chose Forrester Roofing. Pleased with both choices. The roof came in less than we expected, even with the unplanned for ‘slightly big‘ garage glulam. The tiles look great and match with the surrounding properties well. Special note that the Forrester Roofing guys worked exceptionally hard and impressed us all. Rich will be using them again, and we’d certainly recommend them. Edit: Shortly after, Forrester Roofing went bust. The garage glulam makes a big difference. The garage’s roof is now joist free. Giving a much cleaner airier look, and leaving more space for a ramp. Watching Grand Designs suggests glulam are a pretty vogue thing. Given what they offer us in the garage and bedroom it’s not hard to see why. Getting the roof on was a significant milestone. I’m finding it hard to get excited by individual milestones, and don’t step back enough to take it all in. The pressure of the next thing looms large. As soon as one task is done the next tasks are rapidly upon us. Milestones blur into an amorphous blob of progress, challenges, and slowly but surely our dream house. Credit to Rich for his project managing. Keeping tasks lined up and flowing far faster than I can blog about them. Our non-fixed cost and agile approach hopefully helps. I get the feeling we’re not nightmare customers… Yet :D.
Hang on a minute, none of this sounds very Eco? Where are the Eco features? As with the block work we’ve gone heavy on insulation: 175mm of Celotex in the roof, and the ceilings are further insulated with Rockwool. In addition to the insulation, the garage roof’s pitch is deliberately 35°, and the roof is south facing. Making it ideal for Photovoltaic Solar power (Solar PV). After getting a few quotes we elected to go with a local firm, Natural Generation. They proposed 12 LG panels with optimisers allowing for the panels to work independently as some could be in the shade at various parts of the day. More on these in a later energy-related blog post. Conveniently, the panels are hidden from view on the back of the garage roof. In addition to solar PV, I’m eagerly watching the Tesla Powerwall. What a genius idea. Hope they’re as good as they sound.